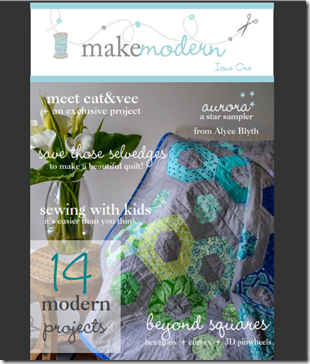 Today is my stop on a Blog hop is to celebrate the launch of Make Modern, the new Australian Online Modern Quilting magazine. If you are new to these parts, Hello! 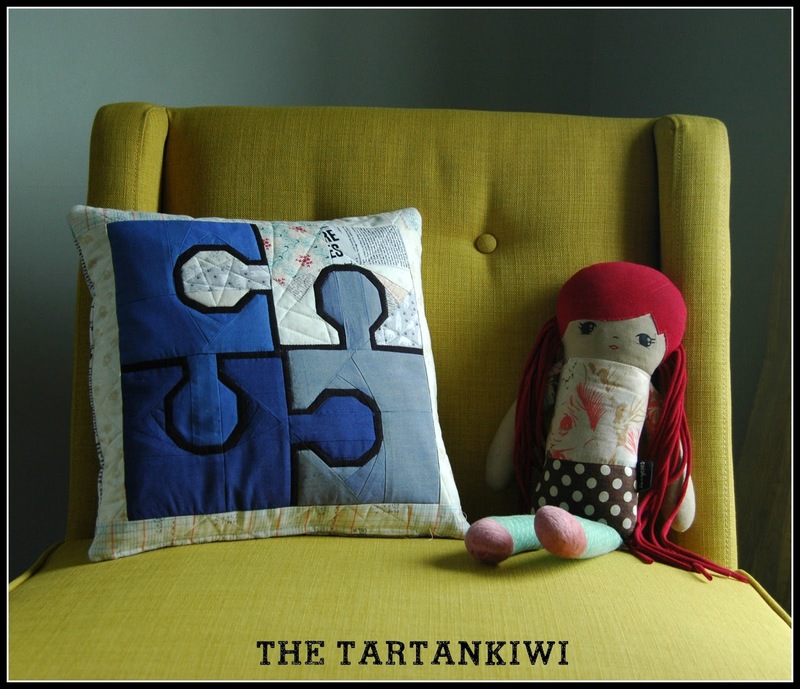 My name is Juliet and I love to design paper pieced patterns. The thing is, I never forget that once I've designed them I set my patterns loose in the big wide world and at that point its your turn to interpret them. I am all for encouraging you to use your own creativity, play with the designs and see what you can come up with. I believe that the sum of our talents often produces something far better than I either of us could do on our own. My contribution to Make Modern Issue one is a table runner called Puzzled. Sure you can make a table runner exactly like the one that I made (I really really love my one), but there is also a great potential for you guys to get creative and have fun! I wanted to plant the idea in your heads that puzzled does not have to be used to create a table runner and in so doing to give you some inspiration how you could use the pattern. 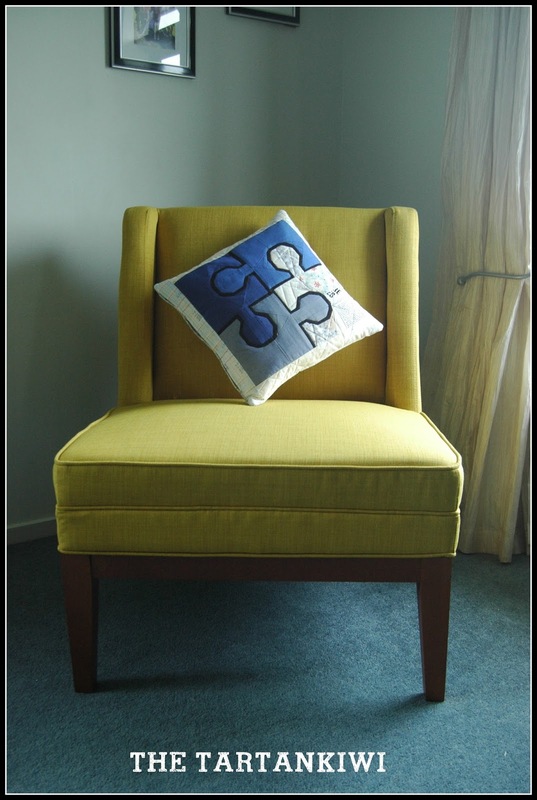 So I decided to take this opportunity to whip up a quick cushion using the paper pieced part of the pattern. 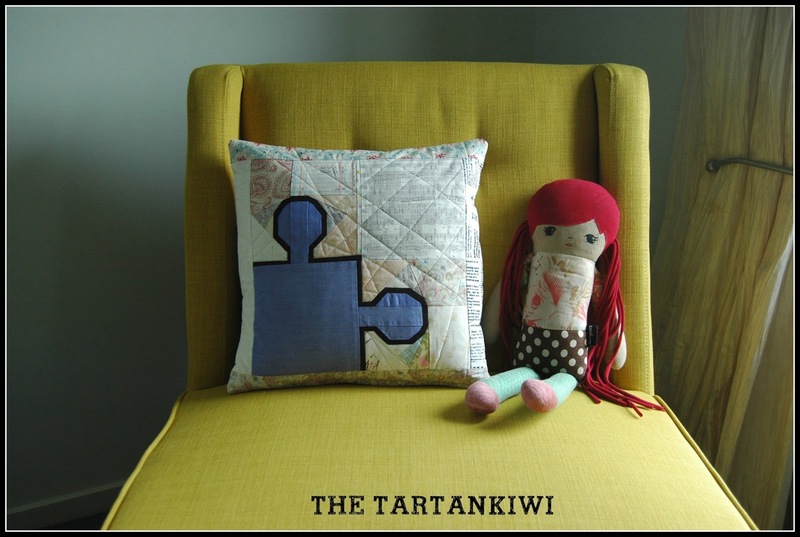 For fairly obvious reasons I called my cushion the Missing Piece. It really appeals to my sense of humour! I used the final scraps of my Oakshott Cotton Lakes fat eight bundle to make the cushion, but I must admit that the fabric choices were dictated by the fabric. I used the four largest pieces of Oakshott cotton that I had. Its good that I did, as I was cutting it pretty fine with a couple of them. I'm not entirely sold on the scrappy low volume background and think that I may have been better sticking with a solid cream background, but I ain't unpicking so it will have to do! I pieced and quilted using Aurifil 50 weight thread. I stitched the ditch around the puzzle pieces to make them pop and then did random straight line quilting in the background fabrics. You might ask why I designed a paper piece puzzle pattern when it could be argued that a jigsaw quilt could be achieved far more easily using appliqué. To me, designing paper pieced patterns is a kind of a puzzle. 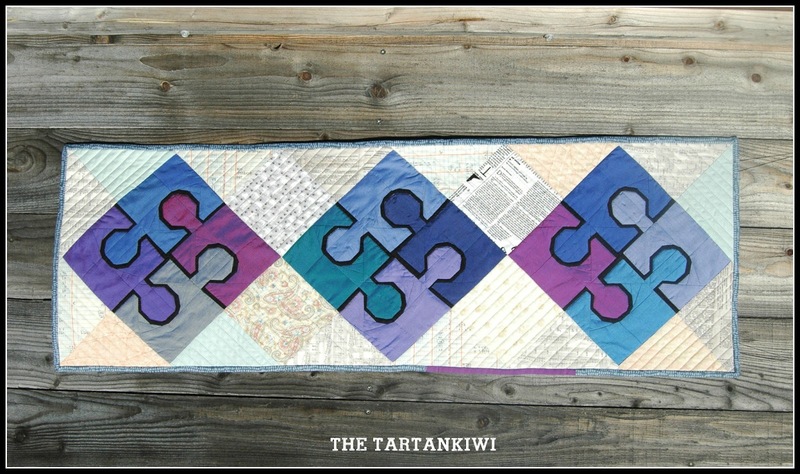 To others, actually sewing paper pieced patterns can seem like an (almost impossible) puzzle. I had it in the back of my mind to design a puzzle pattern for a while, but it took me a long time to work out exactly how to do it. A few attempts were rejected before I finally came up with this pattern. I hope that you can see how versatile this pattern is and can appreciate all the potential for fun. If you haven't bought a copy of Make Modern already, what's keeping you? I'm hoping that I've just tempted you to buy a copy or even subscribe, but if you need a bit more persuasion, you can find a free taster here. Happy reading and don't forget to have fun with my pattern! Awesome block Juliet, I can see some of my family members liking this :-) It's neat seeing the different ways of playing with it too - well done, yet again!! It's a great block Juliet and I love how you've shown how versatile it can be! Thanks for being part of Issue One! I think it is a fun block with so many options! Nice that you have placed your sense of humour into your work!